The Promise of Amazing’s Jersey Roots ~ The History Girl! One of the earliest lessons you learn in any writing class is “write what you know”. When I first started out this confused me a bit because if you only write what you know, how can you create something new? The more I wrote, the more I understood that “writing what you know” refers to the details you alone can bring to a piece, as opposed to simply writing about your own experiences. Specificity is what makes a story unique. Whether in setting, or character quirks or dialect - specific details make the story live and breathe off the page. This is what every writer strives for - that special something that will set their novel apart - first to get it out of the slush pile and then, ultimately, off the shelves and into the hands of readers. So what does any of this have to do with New Jersey? In my case, A LOT. My editor told me one of the reasons she fell in love with The Promise of Amazing was that it had such a Jersey feel to it. I’m not sure I intentionally made the story “Jersey” but there was never a question in my mind that I would set it anywhere else. My experiences growing up in the small community of Bayonne became my filter. This urban setting shaped the characters and how they interacted with each other and helped me flavor it with details that were my own - and uniquely Jersey. Early on, there’s a confrontation between Wren and Grayson that takes place in Stephen R. Gregg/Hudson County Park - actually, the cover of the book seems inspired by this setting. While I don’t mention it by name, this is the park I envisioned as I wrote. I have such fantastic memories of going down the park, as we used to say. Hudson County Park was so much more than a playground and sprinklers - it was a sprawling 97.9 acre wonderland where you could go sledding on Double Hill in the winter and watch 4th of July fireworks bayside in the summer. Landscape architect Charles N. Lowrie who was active in the “City Beautiful” movement of the 1890s - 1900s designed the lovely park that still serves as an oasis from city living. On any given night in the spring and summer you are sure to find wedding parties and prom couples who stop by this park to take photos in the picturesque setting. 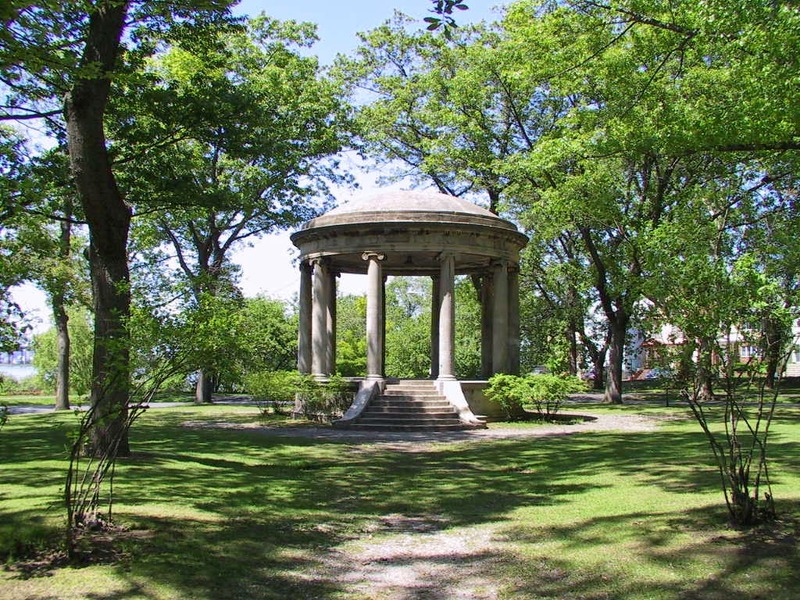 With its stone gazebos, and meandering paths through majestic oaks, maples and spruces, the park is still one of the prettiest places in Bayonne to visit year round. How can you think about New Jersey without thinking “diner”? New Jersey has more diners than any other state and is affectionately known as the “Diner Capital” of the world. When imagining where Wren and Gray might hang out and grab something to eat, it was a no brainer to set the scene in a diner. 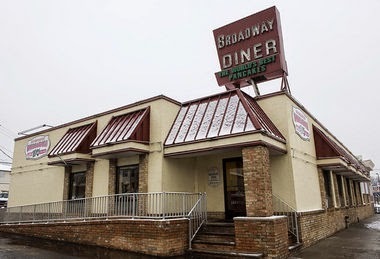 The Starlight Diner in my book is definitely inspired by the Broadway Diner - home of The World’s Best Pancakes. The chocolate chip pancakes are a personal favorite! The diner was a place to hang out, enjoy some good food on the cheap and perfect for people watching. The fact that the diner can be reached on foot is what makes it a great destination for students who might not have any personal means of transportation. “In the Heart of Hudson County, close to Newark Bay, stands a school we all love dearly, alma mater HFA…” so begins the alma mater of Holy Family Academy, the inspiration for Sacred Heart, the school Wren and her friends attend in The Promise of Amazing. Founded by the Sisters of Saint Joseph, HFA opened its doors to both girls and boys in 1925, with its first graduating class in 1929. The school was originally located in a small house on 8th street and Avenue C but eventually expanded to include another building as well. The last co-ed class graduated in 1949. In 1954, the building on 239 Avenue A was dedicated and that’s where the Catholic school was housed until it closed operations in 2013. All of the women in my family (and one uncle) attended HFA, and there was always this strong sense of tradition surrounding the school. You had to earn your way through the front door - which you weren't allowed to go through, on a normal school day at least, until you were a senior. Seniors took freshman under their wing through the “Big Sister-Little Sister” tradition. And springtime always meant plays such as My Fair Lady, Oklahoma and Mame. The final class of girls graduated in June 2013. When I imagined the scenes in school, I knew I was envisioning HFA, but it wasn't until I went back to the multi-year reunion/fundraiser, as the school closed its doors, that I realized just how much of a reference point it had been. As I walked the halls with my friends and fellow former students, I could easily point out the places where scenes in the book took place - the locker bay, the cafeteria, the classrooms and the grounds. While the school may have closed its doors after 88 years - its memory will always linger on with the students who attended there. I loved giving it a fictional nod in my book! Another bit of trivia - I know Sacred Heart is a popular name for Catholic schools, but I took it from the Bruce Springsteen song “Sherry Darling” - when he sings …to all the girls down at Sacred Heart. Long live HFA! There are still many smaller details in the book - like food (no pizza like Jersey pizza!) and the urban setting - that come from my years growing up in Bayonne. I’m very proud of my roots and it’s a place I still enjoy visiting with my family. I know my personal history - rich with the traditions, people, and unique places of the Peninsula of Industry - will continue to influence my writing. Wren Caswell is average. Ranked in the middle of her class at Sacred Heart, she's not popular, not a social misfit. Wren is the quiet good girl who's always done what she's supposed to - only now, in her junior year, this passive strategy is backfiring. She wants to change but doesn't know how. Grayson Barrett was the king of St. Gabe's: star of the lacrosse team, at the top of his class, and on the fast track to a brilliant future - until he was expelled for being a "term-paper pimp." Now Gray is in a downward spiral and needs to change but doesn't know how. One fateful night, their paths cross at Wren's family's Arthurian-themed catering hall. What follows is the complicated, awkward, hilarious, and tender tale of two teens shedding their pasts, figuring out who they are - and falling in love. Robin Constantine is a born-and-raised Jersey girl who moved south so she could wear flip-flops year-round. She spends her days dreaming up stories where love conquers all, eventually, but not without a lot of peril, angst, and the occasional kissing scene. This is her first novel. You can visit her online at www.robinconstantine.com and purchase copies of her book through IndieBound or Amazon.